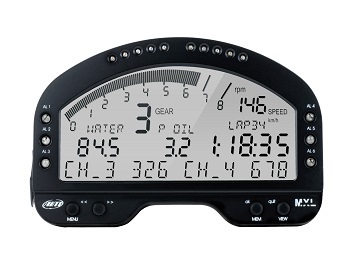 MXL is a complete, modular dash logger: for its features it is appreciated by more than 15,000 racers all over the world. MXL display is fully configurable: it shows the data in different customizable pages, features alarms and shift lights. Lap times are sampled either with optical receiver or via external GPS. They can be set in different ways: static, rolling, predicted and with split times. MXL receives data from analog and digital sensors, from expansion modules and also from your Engine Control Unit, thanks to hundreds of specific protocols developed by AiM. All data can be loaded on PC and analyzed with the powerful professional Race Studio 2 software. Designed to sample and record data, MXL Pista show max/min RPMs, speed and a minimum of 8 customizable channels (i.e. water temp., oil pressure, suspension and steering potentiometers). With its wide backlighted display, easy to read in all light conditions, MXL shows an amazing “racing” look. All information are configurable: i.e. 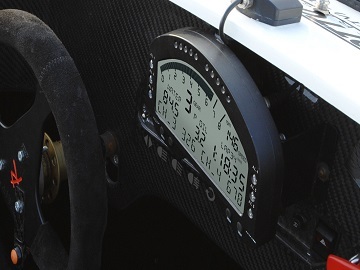 you can see – together with RPM scale – speed, water temperature and oil pressure, lap time and Best Lap. 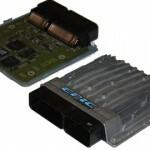 MXL enables connection to the desired sensors with its dedicated inputs: 8 analog channels, 1 speed input, 1 RPM input, 1 integrated mono-axial accelerometer and ECU connections. In the box: MXL Pista, USB cable, Water/Oil temperature sensors with patch cable, Speed sensor, infrared Lap timer, RPM Sensor, standard wiring, Race Studio 2 software.